Christmas is six days away-and Sarah Booth Delaney has her hands full! To honor a group of international investors, Shaw, Mississippi, resurrects the old custom of drifting miniature, lighted Christmas floats down Silver Bayou. The Italian delegation from Venice may bring much-needed new jobs and commercial opportunities to this small, struggling Delta town. Among the investors is notorious womanizer, Enzo Aceto. Handsome, witty, and eager for new conquests, Enzo meets his match in Tinkie Bellcase Richmond. She, too, is an accomplished flirt, and a partner in Delaney Detective Agency. Enzo disappears. Rumors of murder are buzzing. Suspicion falls on Tinkie's husband, Oscar, whose jealousy created a scene at a social event. A body spotted bobbing behind the last Christmas float makes the joyous holiday celebration take on a much darker tone. Tinkie and Oscar flee Sunflower County. Sarah Booth must determine what happened to Enzo, or her partner's and Oscar's holiday will end in multiple felony charges. 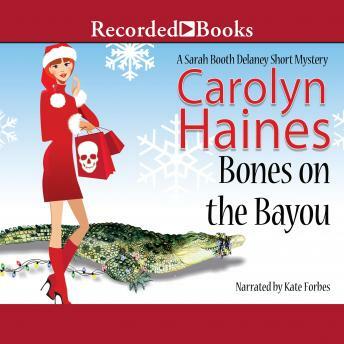 From paid shoppers to canine and feline assistant sleuths, "Bones on the Bayou" brings the Zinnia gang together to solve the mystery-and save Christmas.